I was able to meet my income goals in May. Below is a list of dividends I received in my three accounts this month. My current future dividend for June already meets the goal. I will be working on July targets in the next month. I have been attempting to accumulate an emergency fund in cash. 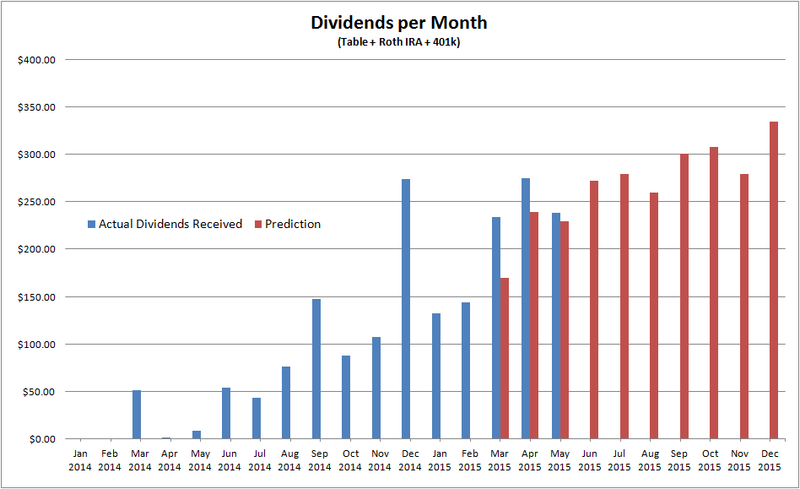 The downside with raising an emergency fund is my monthly contributions are reduced which reduces my dividend income. However, I think it's worth it to be safe and have cash on the side when unpredictable things happen. KMB - FastGraphs indicates that the 15 yr historical P/E is much lower than what it is now. The price is overpriced by 20%. The yield is good however. KO - Fairly valued. Good yield. MO - Expensive but high yield and high dividend growth. May consider adding more to this moaty stock. PM - Undervalued. High yield. Dividend growth this year may be pathetic due to the strong dollar but I am in this stock for the long haul. I see strong prospect in international tobacco growth. UNP - They already went ex-dividend. UNP is undervalued and I may consider if it falls below $100. KRFT - I am not adding more to this until after the merger ends. MKC - Overvalued by around 14% according to FastGraphs. Yield is on the low side for me. PNY: Dividend aristocrat with good yield. Overvalued but will consider it at $34.